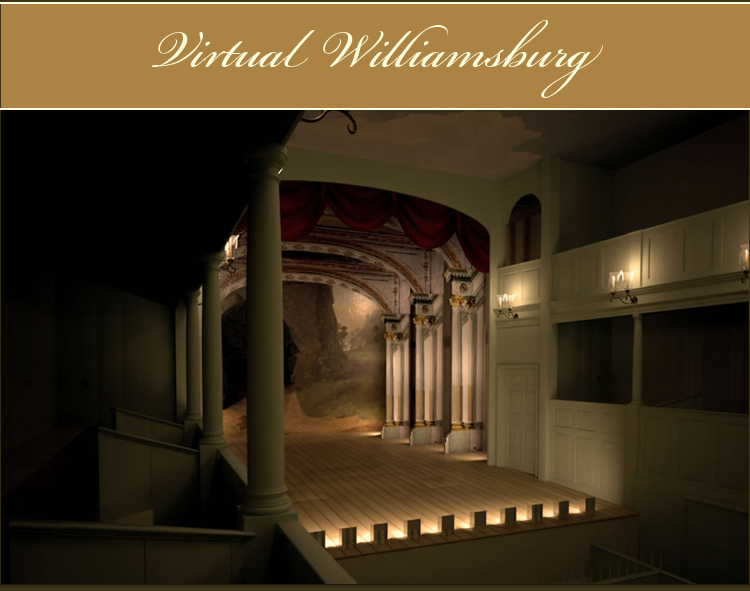 The Virtual Williamsburg Project is a collaborative effort between the Institute for Advanced Technology in the Humanties (IATH) and the Colonial Williamsburg Foundation (CWF) to present the Revolutionary City, that is, Williamsburg, Virginia as we understand it to have existed in 1776. One aspect of the presentation will be a 3D model of the east end of the city. The model will construct Duke of Gloucester Street between Botetourt and Eastern Street (today called Waller Street) and will feature facades of 23 buildings and a recreation of historic landscape in the project area. It will also feature new detailed 3D models of the interior and exterior of five sites: the Capitol Building, the Public Records Office, Charlotte Dickson's residence/store, the Raleigh Tavern, and the Douglass Theater. Most recently, IATH has been working on a digital model of the Richard Charlton Coffeehouse, which CWF began reconstructing in the fall of 2008. The second aspect of the presentation will be access to the documentary evidence that inspires and justifies the specific model designs. These documents span a range from original letters, diaries and legal papers through to research reports, drawings, photographs and interpretative manuscripts. By intertwining these two aspects the presentation will allow the public, students, and scholars to not only see what the town looked like on the verge of the American Revolution and to explore important buildings, but also read original documents and watch videos of Colonial Williamsburg interpreters recreate historic participants discussing their lives during this transformative period. The IATH-CWF collaboration began in 2006 with a one-year pilot project funded by a grant from the Andrew W. Mellon Foundation. A primary result of that project is an extremely detailed model of the Douglass Theater (a narrated look at the model can be seen here, 118K). This continuation of our collaboration is substantially supported by a three-year IMLS National Leadership grant.